I promised this would be a bi-monthly feature, and so here we are with a second dose of Making It Rainfall! The one change is that from this week forward, it will only feature 5-6 levels instead of the original one which had 8. But, there won’t be a decrease in quality, just in quantity. Furthermore, I pledge that every level I post here I have played and beaten myself, mostly to verify that there are no unbeatable BS stages in the bunch. Okay, now that I’m off my soap box, here’s what the theme for Week 2 is – Under the Sea. 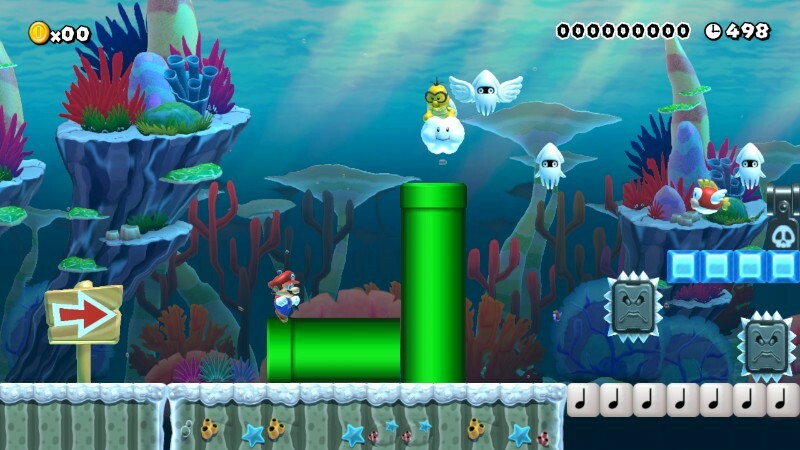 While Airships are certainly a lot of fun, it’s a completely different challenge to take on the aquatic Mario levels. Though all of these stages are primarily focused on watery doom, some also make use of sub levels to mix things up thematically. Without further ado, here are the levels this week! 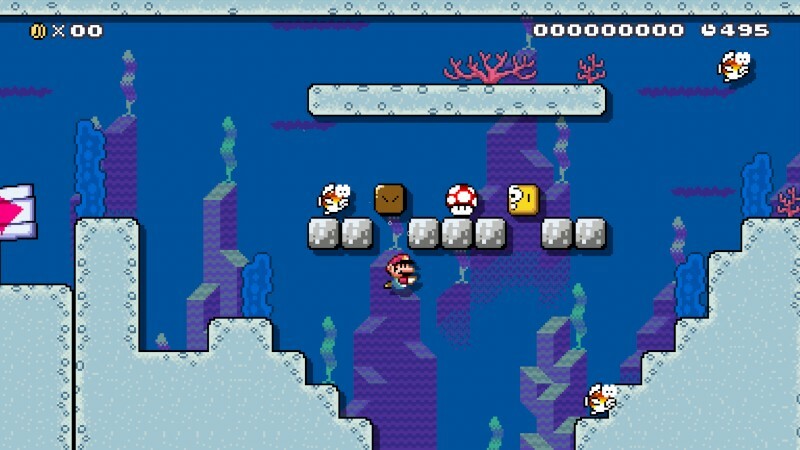 Level 1 – Under Sea Blooper Fortress Jr.
Bowser Jr. has built an underwater fortress. He has cleverly placed his new base inside the home of several bloopers, who are now angry their home is destroyed and now take their anger out on Mario. 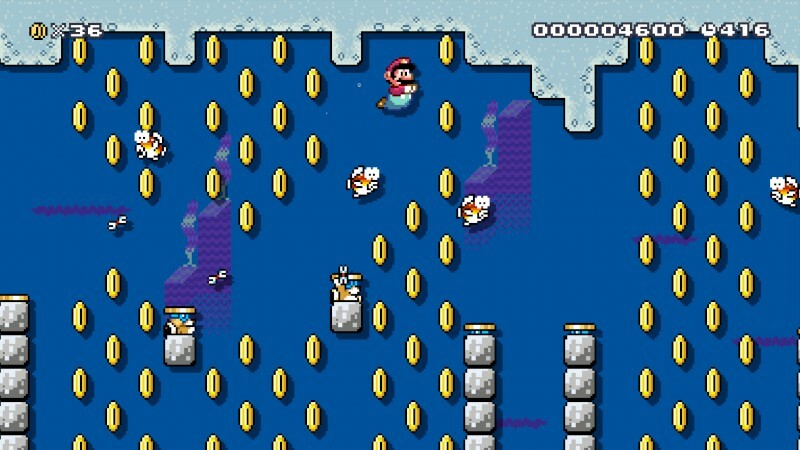 Swim through the level to get to the end level while avoiding the angry group of bloopers following Mario. Can Mario end the reign of Bowser Jr.? Or will he be crushed by the bloopers and Bowser Jr.’s minions? This level recreates some areas of Maridia, the water area from Super Metroid on the SNES. It’s not a full recreation, since there’s no way I could fit all of Maridia into a single course. There are several areas where you can hit a P-switch and then backtrack a short distance to access secret areas. I know some of you will wonder why I did not use the Super Mario Bros. style so I could have given you the Samus mystery mushroom. The course seemed too bland in the Super Mario Bros. theme, so I kept the Super Mario World style instead. The walls are not as thick as I would like in many areas, due to the game’s block limit. Level 3 – Enter Toilet and Unclog the Sewer! Mario is a plumber and now he has to do some plumbing. 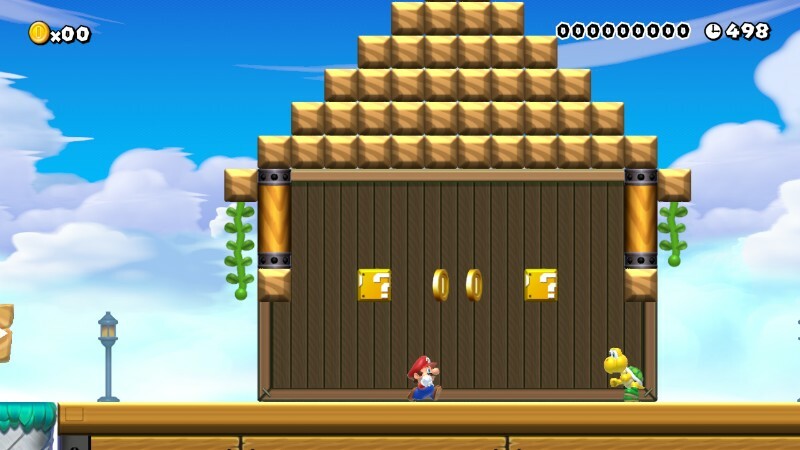 In this level, you will travel through a small town overrun with Bowser’s henchmen such as goombas and koopa troopas. In one building you will find a toilet that will lead you into the sewer system, which is clogged up. So of course, it’s up to Mario to fix it! You will have to in order to reach the goal… or will you? As with my other levels, there are 1UPs hidden around, but this level has 4 hidden in it. There is also a secret shortcut that can allow you to reach the goal without ever entering the sewers. If you succeed and exit the sewer via another toilet, you will get a bunch of fireworks as you approach the goal and finish the level! Level 4 – Can You Beat The Bowser Fish? Think of this level like the Sea World from Hell. 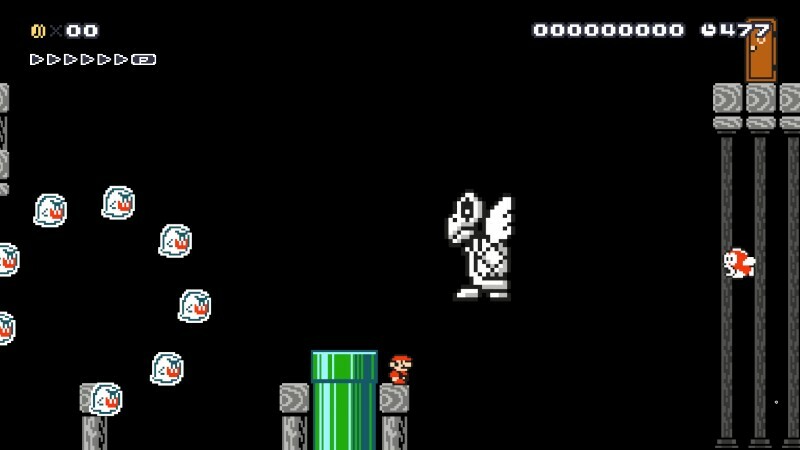 It is a gauntlet of traps, cheep cheep and bloopers, which culminates in a potential boss fight against two Bowser “fish”. While you can certainly beat the level without beating them, the real challenge is taking them on armed with your Fire Flower. For the devious, there is a hidden Star Block to aid you in your fight, but real plumbers don’t need that to beat a pair of stinking King Koopa! What is more frightening than a Ghost House? A Ghost House with underwater segments! This level has lots of tricky jumps, challenging swimming segments, and lots and lots of groups of Boos. Though totally fair and not broken, this will test the skill and patience of even the heartiest plumbers. Are you game? 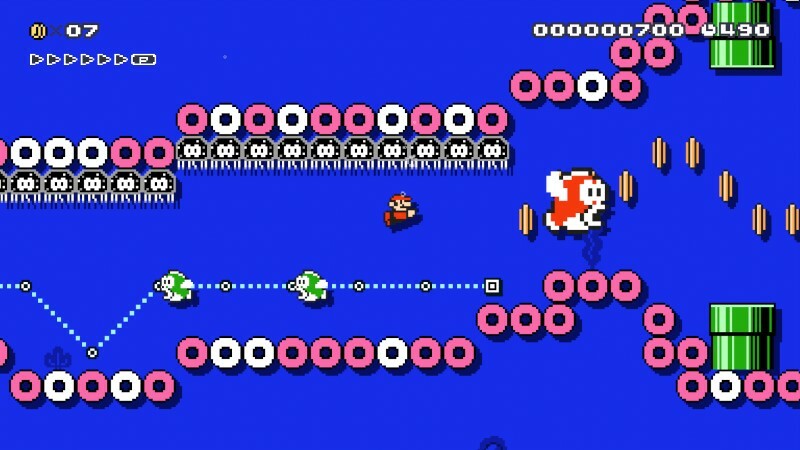 Though probably the easiest of my levels, Undersea Excursions is a level that reflects the mellow yet devious music found in Super Mario World’s underwater sections. It has a hidden treasure trove, lots of traps and a couple of tricky Ground sections. Only a true plumber can get through this Undersea Excursion unscathed! That’s it for Week 2 of Making It Rainfall! Join us later in October for the 3rd and 4th installments, the first of which will be focused on a oldie but a goody – Castles! And as always, feel free to comment and tell us how you like the levels below, and please star levels that you enjoy!